With the Visitors activity, you can see a real-time list of all the visitors currently on your website. It helps summarize all visitor information at a glance, including information about their browser, operating system, location, pages visited, and referral page. This visitor information is only available for websites with the widget embedded. You cannot view a visitor's path on websites that do not have your widget added. Incoming chats: Visitors who have clicked the chat button and asked a question.Note: This only includes visitors that are in a currently signed-in agent's department. See Creating agents and departments. Chat button clicked: Visitors who have clicked the chat button but have yet to start a chat. Trigger activated: Visitors who have activated a trigger. Currently served: Visitors who are being currently served by other agents or yourself. Active website visitors: Visitors who are moving around the website and clicking on links. Idle website visitors: Visitors who are currently on the site, but not interacting with it. Click the List tab to view visitors in a list, as shown above, or click Visual to see visitors in visual mode. Online: How long the visitor has been on the website. Message: The most recent message left by the visitor in a chat. Viewing: The number of pages with the widget script the customer has visited during this session. Visits: How many times the visitor has been on the website in the past year. Chats: How many times the visitor has initiated a chat. Served by: Chat agent currently serving the visitor. 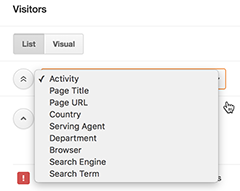 Activity: This is the default page and breaks down visitors based on the actions they have taken on your website. Page Title: Groups visitors based on the page they are on. Page URL: Groups visitors based on the URL/link they are on. This is normally different from the Page Title. Country: Groups visitors based on the country they are from. The visitor's IP address tells us which country they are from. Serving Agent: Groups visitors based on the agent who is serving them. Department: Groups visitors based on department. Browser: Groups visitors based on the browser they are using to access your website. Search Engine: If the visitors arrived at your website through a search engine (e.g. Google), they will be grouped under this category. Search Term: If the visitors typed in a search term to get to your website, they will be grouped in this section based on the term they used. If you experience higher traffic (5000 or more concurrent visitors), you can switch to the High Load Dashboard. Unlike the standard Visitor List, the High Load Dashboard only shows Incoming and Currently Served chats. 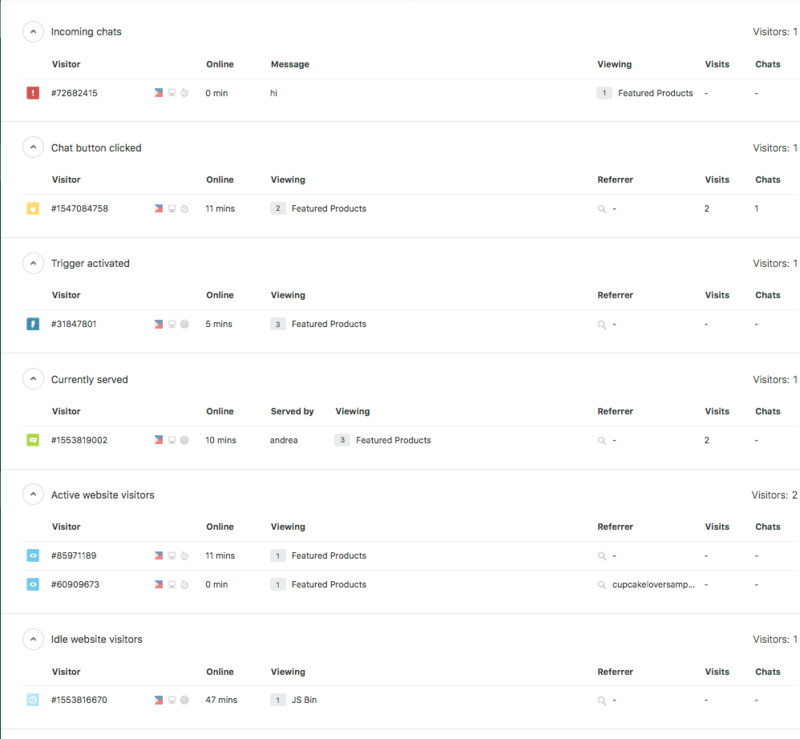 The High Load Dashboard is available to all customers on paid plans. From the dashboard, go to Settings > Account > Visitor List tab. Select the High Load Dashboardcheck box. Return to the dashboard and verify that only Incoming and Currently served chats appear. Curious why does the Zendesk visitors view show less visitors than google analytics? Is there something it's not counting? Today ZenDesk is showing more than GA. What is the discrepancy? The difference in number is usually due to the timezones being different. Also, I have seen cases where visitors block GA and the events don't get sent but the chat gets recorded.